Just two weeks ago I was in the middle of the Eurovision bubble, in Baku. Now, it's like it never happened. Eurovision 2012 may be over but it won't be easily forgotten by those who were there. Something interesting happened this year though, the big fan favourite of the contest actually won! Sweden's Loreen was riding high in both the betting odds and fan polls and yet somehow I didn't think she would actually take the trophy. There have been too many times when a big fan favourite has failed at the final hurdle; Hungary in 2011, Iceland in 2010, Sweden in 2008 and of course two of the most spectacular flops: Belgium in 2006 and Cyprus in 1999. Personally, I didn't mind the song, I thought it was ok and still do. It wasn't my favourite (good old Eesti was, and still is!) but I am happy that Sweden won. Why? Well two reasons: firstly, it's a massive hit all over Europe which is good for the contest. "Euphoria" is currently sitting at number three in the UK top 40. This is an amazing achievement and means that the 2012 Eurovision winner is the biggest non-UK Eurovision hit since Germany's Nicole hit the top spot 30 years ago! The second reason is a purely selfish one; Sweden is easy to get to and accommodation will be (hopefully) pain-free to arrange! Now the beer prices, well, that's a whole other matter! Hard luck to the UK, finishing second last was certainly disappointing. I thought the BBC made a brave decision to choose The Hump and in terms of UK audience, it was a stroke of genius. When it was announced that Engelbert Humperdinck would be representing the UK in Eurovision, there was intense media interest. The story featured on both the BBC and ITV news programmes. In terms of the profile of the contest, it was a triumph. As for the song, it was pleasant, unoffensive and perfectly crafted. However, it wasn't instant enough for the average viewer and poor Engelbert's renditions were just a little bit off. On the Friday evening, when the juries were voting, The Hump didn't turn in his finest performance. That will have undoubtedly cost the UK valuable jury votes. On the Saturday night final, he looked a little out of his depth and ultimately delivered a disappointing performance. There was also the draw which didn't help poor Engelbert and the fact that this year was deemed by many fans to be a strong one and the winner too close to call. I don't buy into the notion that "Europe hates us". We just weren't good enough. As much as I think the BBC made a brave and genius decision to select The Hump, he hadn't had a hit since the 1970s. Yes, there is always neighbourly voting - that's always been the case in Eurovision and probably always will be. The UK and Ireland are just as guilty of that these days. Ultimately though, the winner received points across the board with only one country, Italy, failing to give Sweden anything. If the UK are hated so much by the public then how come Blue finished 5th in the televote last year? How come Jade Ewen finished 5th overall in Moscow in 2009? Eurovision is a television show on a Saturday night, do we really think people are sitting at home thinking "that's a great song from the UK but I couldn't vote for it because of David Cameron"? I think such notions, quite frankly, give too much credence to the average voter in Eurovision. Part of the issue may also lie in the voting structure in Eurovision. Only ten countries score points (1-8, 10, 12) so technically The Hump might have been mid-table with many countries and failed to score. In a strong year, in a field of 42 entries, what makes us think that we deserve to be up there for simply gracing the stage? If the UK public couldn't get behind the song (it charted at number 60), then how can we expect Europe to vote for it? Such attitudes fail to acknowledge that Eurovision has changed and we have to change with it, come back next year, with something fresh and new and give Europe a damn good thrashing! Hard luck Engelbert, you were a fantastic ambassador for the UK and didn't have a thing to lose! Thank you for the music! "Tonight nobody could vote for their own country. But it is good to be able to vote. And it is good to have a choice. Good luck on your journey, Azerbaijan. Europe is watching you." The volunteers and the ordinary people I met in Baku were wonderful. They were so incredibly friendly and helpful and were a credit to their country. Special thanks should also go to my friend Zuly who helped to arrange accommodation and contacts for me and also her brother Haji who was incredibly hospitable and provided us with a memorable evening of fine cuisine and followed by some karaoke I'd rather forget! 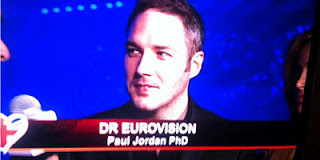 For me personally, Eurovision 2012 was exciting and interesting. I was fortunate to be interviewed by a variety of media outlets including the BBC's World Service as well as The Telegraph, Daily Express and even The Sun! I owe a debt of gratitude to the BBC3 team as well who produced the UK coverage of the two semi finals and provided me with a platform as 'Dr Eurovision'. I came home feeling very exhausted but overall, incredibly happy. Many of my friends talked about experiencing PED or Post-Eurovision Depression. I too have had a few pangs and certainly missed the friends I have made over the years and the new ones I met in Baku. I am already looking forward to being reunited again as our thoughts turn to Sweden in 2013. Ulimately though, it's back to reality which for now, is outside of the Eurovision bubble.